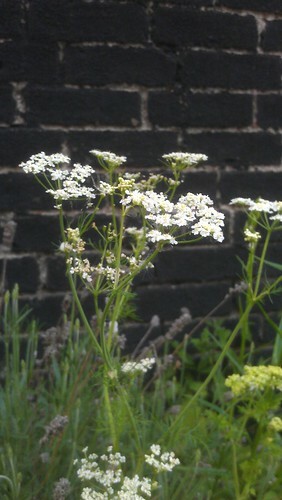 After weeks of dreary rain, and then days of hot sunshine, the garden has rapidly grown. Today has seen the first flowers emerging from the lush green growth that has flourished in the recent weather conditions. 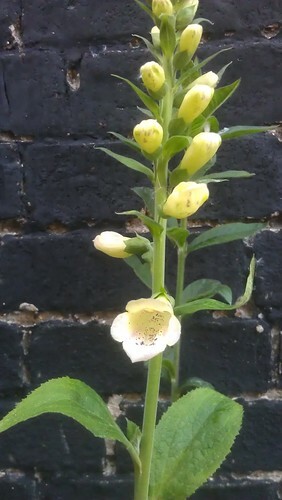 The Foxglove ‘Excelsior Hybrids Mixed’ that I sowed last year and have spent months nurturing, have finally opened the first of its flowers, having spent the last couple of weeks reaching skywards with long prongs of tightly closed buds. The first of these opened today, but many others have their buds ready to uncurl in the next few days. It’s very satisfying to see these finally come into flower. 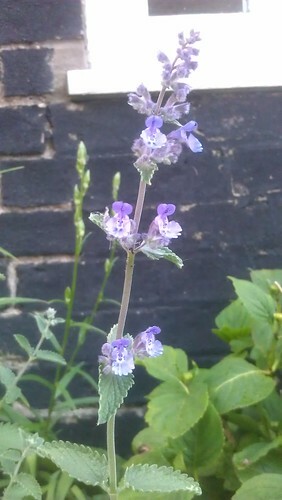 The Nepeta ‘Six Hills Giant’ survived the winter. These Foxgloves were joined by the return of the Nepeta ‘Six Hills Giant’ with its gentle blue flowers that lure bees, and the bright white of the Caraway ‘Carum Carvi’ herb – another survivor of the winter, which probably disgusts mistaken passers-by who wonder why i’m growing ‘Cow Parsley’ (Anthriscus sylvestris). Anyone following me on twitter will know that after all my efforts to encourage bees to the garden, I have somewhat overdone it…. by getting bees in my loft. Whilst they pose no immediate harm, a bee-keeper will soon be venturing through the loft hatch to coax them out before they do any damage. In the meantime, their night-time buzzing and strange noises are fascinating, and there’s a distinct warm spot on my ceiling, caused by their nest, which gives an agitated buzzing reply if you gently tap it. I’ve also planted out some of the Salvia ‘Farinacea Victoria’, the French Bean ‘Blue Lake’ and the Nasturtium ‘Jewel Mixed’ – the latter two no doubt causing great joy amongst the snail herd.